From the sink westward the havoc was fearful. “Sir,” he writes, “by the time this reaches you I presume that you will need no evidence from me to satisfy you of the alarming and wretched condition of these people. It appears that the judgment of God has pursued them from the time they set out up to the present. First cholera — then starvation — next war, starvation, and cholera. The day has now passed when anyone will have the hardihood to say that there is no suffering amongst the Overland Emigrants; at least no one who is within 200 miles of this place will make such a declaration. When I tell them (the emigrants) that they are 400 miles from Sacramento, they are astonished and horrified; many disbelieve me. They were induced to believe when at Salt Lake, that they were then within 450 miles of Sacramento City.” Indians have stolen a great number of the emigrants’ stock, he says, and scarcely a day passes when there is not a skirmish with them. Many women are on the road with families of children, who have lost their husbands by cholera, and who will never cross the mountains without aid. There are yet twenty thousand back of the desert, and fifteen thousand of this number are now destitute of all kinds of provisions, yet the period of the greatest suffering has not arrived. It will be impossible for ten thousand of this number to reach the mountains before the commencement of winter. 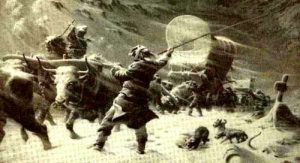 All remember the fate of the Donner Party. On September 15th Waldo is back on the Truckee river sending in frantic appeals for supplies. He is issuing, he says, from five to eight thousand pounds of beef per day, and flour only to the sick. The station is surrounded by sick, unable to proceed on their journey. The flour deposited at Bear Valley by the Marysville train has not arrived. The relief raised by the Feather river towns has failed for want of system. If the people ofCalifornia wish to extend efficient relief to the emigrants, their supplies must be placed under the control of one agent. The emigrants must have bread; thousands must die unless they can be supplied with bread. The cholera is killing them off from this point to the head of the Humboldt. Ten thousand pounds of flour should be immediately forwarded to the Truckee station and another station established near the summit with the same amount, and such other articles as are necessary for the sick. If the money cannot be raised for this, he offers to turn over to the committee, or to any other body of men, real estate in Sacramento which has cost him ten thousand dollars, if they will advance at once eight or ten thousand dollars, forwarded in flour and other necessary articles for the sick, to the summit and to the Truckee station to save ten thousand human beings from starvation. He says that if he were to describe the cases of extreme suffering that he has seen in the last fifteen days the account would occupy a quire of paper. He was to leave on the morning of the 16th for the head of the Humboldt to induce all that are yet from four to six hundred miles back to return to Salt Lake. Ten persons died of cholera, the day before, while trying to cross the desert. By September traders were flocking to the desert with supplies, selling flour at one dollar and seventy-five cents to two dollars and fifty cents per pound. They also carried water and grass into the desert and gathered up the animals they found abandoned. They sold water at half a dollar a pint. Many of the emigrants had no money and were obliged to part with their property. In starting out many put nearly all they had into outfit; others thinking they were going to a land of gold did not bring much money with them. It was a great mistake. Money was required for ferriage across streams, for supplies, and for various purposes, and the want of it caused loss and hardship. At length the emigrants reached the end of their journey, but their troubles were not over; they were attacked with fevers and bloody flux, and many perished miserably after having endured all but death in crossing the plains; they reached the Sacramento Valley sick and weary, with the horror of the scenes through which they had passed still upon them. For a time they were distressed and unsettled. Their numbers were so great that the relief extended by the miners, large as it was, could not reach them all, and many suffered and died for want of proper care and the nourishment which their condition required. Many were happy at first to get employment to pay their board, and even those accustomed to the luxuries of life were glad to get any servile employment suited to their strength and ability. Gradually the dark gloom that over-shadowed them was dispelled by the kind treatment and aid they received on all sides, the memory of their suffering faded, and with returning health hope revived and ambition again awoke. Most of the states of the Union were peopled by a steady influx of settlers from other communities. California was suddenly changed from a quiet pastoral community, to a mining camp. A great population was poured into it from all quarters of the globe, all actuated by the most intense and absorbing of motives, the quest of gold. Some to mine for it, some to supply the gold miner with the means of existence, and some to prey upon him. Some saw fortunes in trade and in the building of cities; others sought to reap the great profits resulting from the cultivation of the fertile soil. 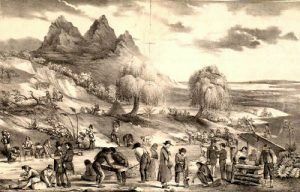 The farming class found a large amount of the best lands in private ownership under the Spanish grants. They were not disposed to submit quietly to this condition of affairs and in many cases “preempted” what they chose to consider unoccupied land, ignoring the obligations of the treaty of Guadalupe Hidalgo which guaranteed to the Californians the enjoyment of their liberty and property. Both Colonel Mason the governor, and General Riley his successor, endeavored to protect the owners of property, but the failure of Congress to provide a civil government for the territory, together with an insufficient force to compel obedience to their mandates, made the matter a difficult one.